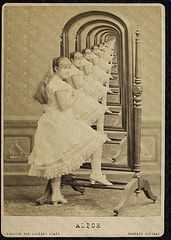 Like a looking glass (mirror), correlations are a tool for seeing yourself — your own mind. (See Tools of Taoist Thought: Correlations.) As such, they should appeal to anyone determined to find underlying causes. Of course, you’ll eventually reach The gateway of the manifold secrets as chapter 1 says. Therefore, the correlation’s process may only attract those for whom ‘the looking for’ is more satisfying than ‘the finding’. It is like looking through, rather than at, a mirror’s reflection; the closer you look, the fuzzier the view. Correlations are a success in failure. They succeed in failing to offer more than a tentative answer to any question. The good news: All questions are answerable. The bad news: All answers are indistinct and shadowy. As chapter 14 describes it, This is called the shape that has no shape, The image that is without substance. Few people want indistinct and shadowy answers, so you’ll need to try this process out to see for yourself. The good and bad news here corresponds to how biology drives us to seek answers (good) and avoid the indistinct and shadowy (bad). On the other hand, perhaps it is just vice versa. As chapter 2 says, The whole world recognizes the good as the good, yet this is only the bad.